When the latest Cath Kidston catalogue landed on my doormat recently, I was immediately inspired by their colour palette of blue and white floral prints, and got straight on the hunt for some blue roses from Minerva to make my own dress. The ‘Floral Print Jardin Stretch Cotton Sateen’ Dressmaking Fabric was exactly what I was looking for - bold and beautiful. When, a few weeks later, my copy of Love Sewing arrived, I couldn’t help noticing that one of the illustrations on the pattern envelope that came free with the magazine was also a blue floral print! I don’t know about you, but I always associate rose prints with Gertie, so I chose my ideal pattern of hers for this print: the Surplice dress from the book ‘Gertie’s Ultimate Dress Book’. I have made this dress before as a Minerva project, and I really like the bodice style, so I knew it was going to be a winner. Last time I made the Surplice dress, I was using fabric that was only 45” wide with a clear vertical print, meaning that I was unable to cut the skirt as drafted by Gertie on the cross grain, so I chose a skirt from a different pattern instead (New Look 6776). This time, however, my fabric was 60” wide, and had no clear directional print, so I was able to cut Gertie’s side pleated skirt. Cotton Sateen Fabric is quite thick, so it has more body and structure than drape, and as a result, it holds the shape of the skirt really well. The fact that this fabric is quite sturdy means that even though it has an ivory background, it does not need lining, and even without lining it feels really soft on the skin. It also has a bit of stretch. It is a fabric of wonder!!! I followed all the instructions precisely, including Gertie’s method of sewing a lapped zipper in a garment with a lining or a facing. I don’t think I’ve done it this way before - I think I just use the usual method of inserting the lapped zip onto the main fabric and then sorting out the facing afterwards. It turned out ok. It might be a more useful technique if you are fully lining a dress, but for a facing it didn’t seem worth the effort to be honest! 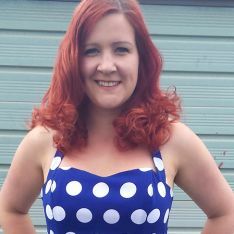 I was able to make the dress in just one day, which was very pleasing, and I wore it the next day to the Sew Up North meet up in Leeds which was great fun! So lovely to see old friends, meet new friends, and treat myself to a few lengths of fabric! Thank you to Minerva for the beautiful fabric, zip and thread. I felt great in my new dress and I can’t wait to wear it again on a nice sunny occasion!